Just a quick reminder that the Winners from Anything But Cute's - Vintage Garden challenge were announced this morning. I was so impressed with all the amazing entries we got last month, I really wish we could have chosen everyone as a winner! I want to thank everyone again for all your kind words and your support, we had a great launch and look forward to many more fabulous challenges with you!! So now on to my little summery tag here. Quite honestly, I was just looking for an excuse to play with my new Ecoline inks. Today it's PINK, YAY!! Yesterday my very wonderful and talented friend Cec came and spent the day with me! She had a great deal of influence over the outcome of this tag, so a big thank you to her for some of these details. The wreath is Memory Box, the leaves are from Prima, the sentiment is from Kaisercraft, the doily is from Cheery Lynn. 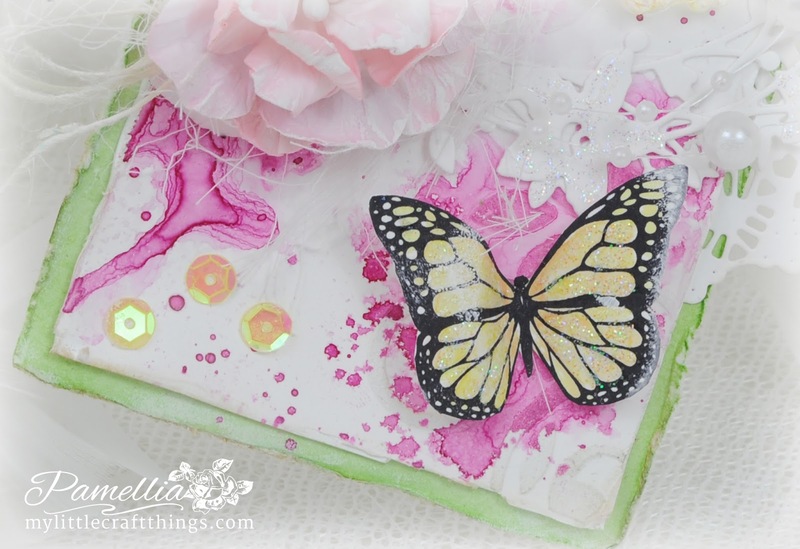 The butterfly is from Michaels and coloured with distress inks Scattered Straw and Squeezed Lemonade. Sentiment and butterflies were stamped with Ranger Archival ink Jet Black. The frame was made with a mold and I added some yellow glitter glue along with some Starburst Stickles. The flowers were made with Joy Crafts and coloured with Spun Sugar and Scattered Straw. The leaves were coloured with Mowed Lawn (my first time using this colour...it's bright but I like it). In the background I actually used a large damask stencil to lay a pattern, but it's kind of obscured by all the fabulous Ecoline swirls. ARE THOSE SEQUINS THAT I SEE THERE??? Why yes, they are. I actually have an entire box filled with sequins and I've never used a single one...you can thank Cec for encouraging me to put a few on the background. I love how they look. A beautiful tag Pamellia. I love the swirling effect of the gorgeous pink Ecoline ink and the pop of orange from the butterflies, frame and sequins is really pretty. The doily and lace are great additions and your flowers are wonderful as always. Sally.x. First of all, my dear, I'm so sorry I haven't been over to ogle your designs lately - I've been hopping along the coffee lovers blog hop and now I feel like I'm neglecting my friends! Anywho, I am DROOOOOOLING over that inky background. I guess I'll have to look up Ecoline inks to figure out what they are. 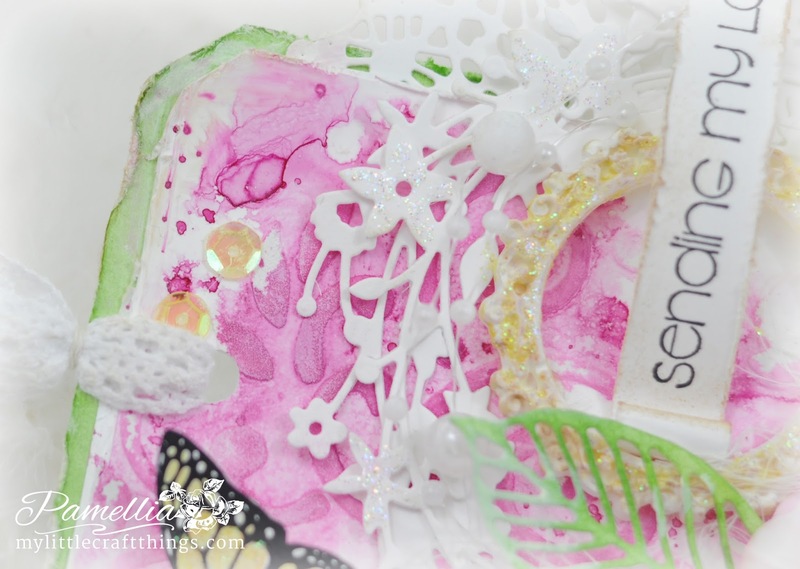 I love the bright, springy feel of this, and I love the subtle texture you added with the sparkly paste. Vibrant little details, real nice work! This is so pretty Pamellia, the summery colours are so bright and cheerful. I love the mixture of die-cuts and elements you have used and that inky background is gorgeous. This is an amazing card! Love the buttrflies! A gorgeous tag Pamellia, such beautiful colours and fabulous details as always. Such a delicate design ! Like spring ! Gorgeous! I love the colors! Have a wonderful and creative weekend Pamellia! Beautiful tag love all the wonderful colors you used so bright and cheerful . Oh what lovely creation, thanks for sharing with us at CCCB! Such a pretty tag Pamellia. I love the inky background, beautiful summery colours and gorgeous detailing. Stunning tag Pamellia, beautiful colours and lovely details. A real beautiful feminine tag, love the pink colours. What a fresh colour pallete and fantastic design, Pamellia! I really need to try those Ecoline inks, you inspired me with that awesome background you've created! Stunning tag, my friend! Have a great weekend! All of the fabulous elements on this tag. I could never have imagined doing something like this. Your friend must be a wonderful influence on your crafting. Thanks for playing in the Mod Squad challenge with week. Stunning Pamellia, love it to bits, so, so pretty. You do manage to pack and awful lots onto your creations, If I did that they would just look a mess lol! Fabulous a-b-c went so well, thank you for giving me an honour lol! Its been an excellent day for me today but more on that another day. I love tags, and this one is gorgeous, Pamellia! Those flowers are beautiful--I'll have to try to get that die. This tag is bright and cheerful. How fun it must be to have a friend to craft with! What a gorgeous tag my dear!!! Love those bright colors and such pretty layering of gorgeous elements!!! I wish I could have join Cec and you!!! :( I have been super busy at home, finally got a chance to sit down and admire this crafting gem!!! Hey, I see you are expanding your horizons with sequins :) very cool!!! Now my DT hat on: Thank you so very kindly for joining us at CCCB this week!!! This is amazing - love all the colours and textures you have used, and the dimension - wow! Oh, Pamellia! Love the colors you used on this spring time tag! I'm not a pink person, but this is my kind of pink! I bet you are loving those Ecoline paints, because I see you added another color to your collection. Those butterflies are mmmmm, mmmmm, Good! Love their sparkly wings! I need to thank Cec for putting that sequin idea in your head, because they add a perfect compliment to the butterflies. I hope you will auction this one off, because I will be first and last bidder! Just beautiful! Huge hugs! A very beautiful tag Pamellia !! I like this pink !! I just love pink- and this tag is so pink! Love it!!! I love the dies, the shimmer and the sequins as well- again, all of the details are delicious : ) Awesome work- looks like a wonderful crafty play date! Gorgeous tag! Love the beautiful fresh colour combo you used on this one! 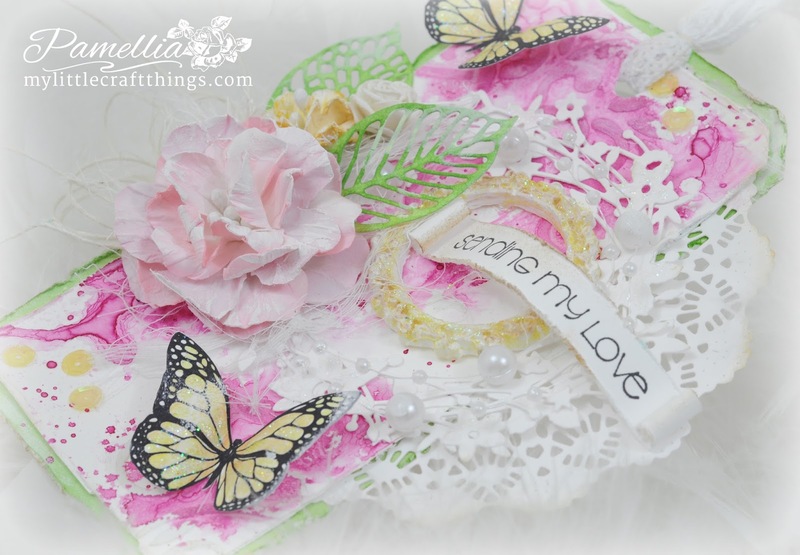 The butterflies look super too and how fun for you and Cec to be crafting together!! Summer on a tag Pamellia, love everything about it and I am always rather partial to pink and the little hints of green bring it all to life. If only the Christmas cards were for my stash then I would avoid that last minute rush, but they all have to go off to the studio for the TV shows and I am sure this year will be the same as most, when time comes to make my own I will be totally fed up with Christmas and ready to move on to spring. Yesterday was our warmest so fat this year, where was I - in my craft room and you can guess the rest. The colors remind me of cool n juicy watermelon :D ! Loved the layering and bright pretty look has freshened my mind ! Aww so beautiful, full of sparkle color and texture, i love it. Yay to sequins!! Lovely tag Pamellia ... I love those beautiful swirls and drips of bright pink ... Have a brilliant weekend! Once again Pamellia, a gorgeous creation. I love your pink and green combo...so fresh, and spring-like. Those butterflies are sooooooo real, they look exactly like the ones that flutter around my garden each day. You always perform magic with your flowers, and these ones are no exceptions. So glad you enjoyed your day with your friend Cec, and I'm also glad she suggested that you add the sequins...they look wonderful! Thank you tons, Pamellia, for the 2 'Anything But Cute' awards. I feel immensely honoured. What a beautiful tag Pamellia! I love the colors and your gorgeous sparkly butterflies! Pink is my favourite colour so you know I love your tag! Gorgeous background and wonderful die cuts! The butterflies look amazing! I love all the sparkle! Looks like you and your friend had a marvelous day! Thank goodness my 'puter is working today, so that I can see your wonderful talent at work again, this is another amazing result with all your play things. Wish I could have played with you 2, I would have learned so very much. Oh how pretty, Pamellia! Love the use of die cuts and your lovely background! Those butterflies are so pretty! Happy Weekend! OOOOOweeeeeeeee - how I would have loved to have been a fly on the wall watching you and Cec creating together Pamellia. I must say... it is so OBVIOUS how much more STUNNING this project is under her tutelage. For example, those sequins upped the YUMMY-NOUS by at least two marks on the LOVE scale! Seriously... it's soooooooooooooo SPECIAL. I am not a pink lady but I really am enjoying looking at this beauty... and I think it is because of that luscious green you used. Nevertheless - it's WONDERFUL. j. So beautiful, I love this tag Pamelia, as usual I adore all the care and detail you put into your work, gorgeous! This is gorgeous! Your textures and layers are fabulous! Thanks for joining us at Tuesday Throwdown. 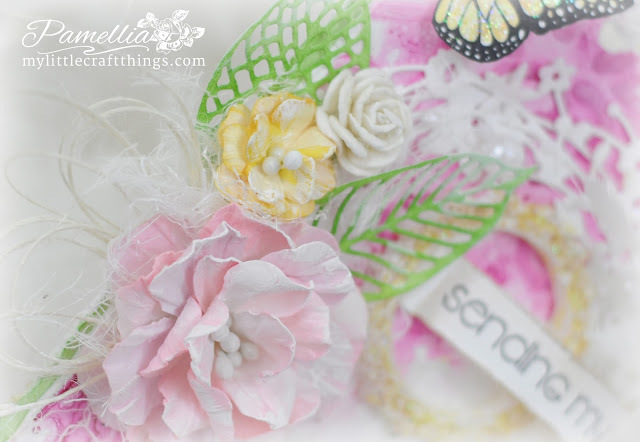 Beautiful Pamellia, love your colour palette and all those lovely die cuts and embellies. How fun you got to spend a crafty day with Cec, your house must have been alive with inspiration between you two talented gals! Glad she talked you into using the sequins, a lovely touch! So much inky goodness! I love the summery color palette, and the wonderful handmade flowers! It's as light and airy as a summer garden, Pamellia! The sequins are a fun finishing touch, too! Gorgeous tag Pamelia! It captures the essence of Spring. 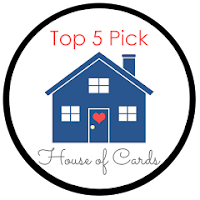 Thanks for joining us at House of Cards challenge blog. WOW so pretty as always...rejuvenating creation Pamelia! Whenever I visit you it always brightens the day and this is no exception. Beautiful...so soft, and full of pretty details!! Thank you for joining us at "Fussy and Fancy" for our "Distressed" challenge!! Fabulous and fresh looking and spot on for House of Cards. Terrific florals as always. Glad you enjoyed your day with a crafty chum. Absolutely gorgeous, stunning colors and so many layers! I love the gold circle that accents your sentiment. Very lovely. Thank you for sharing at Tuesday Throwdown! 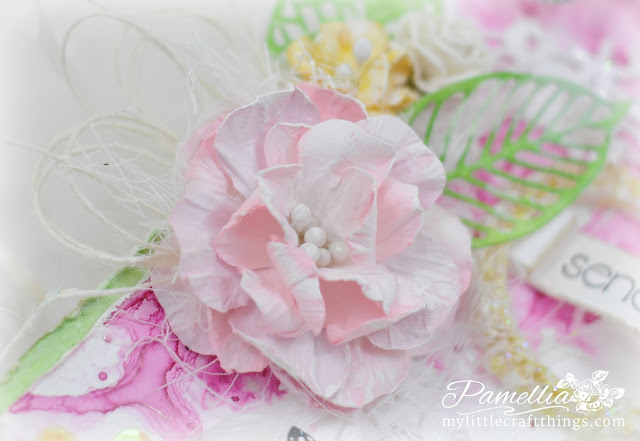 Wow Pamellia this is one very beautiful tag love the base colours also that awesome flower and butterfly, stupendous make. ooh, I love everything about this tag! So beautiful friend! Lovely card, beautiful layers, textures! Stunning. Light and frothy and lovely! I love the zesty greens, they have given this creation a wonderful springtime feel, especially when used in conjunction with the pretty pinks. Your design really sets off the delicate flower and sweet butterflies.